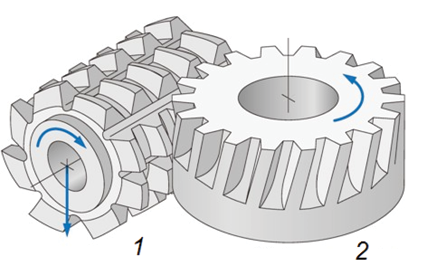 Invention of the gear-generating machining process that uses the gear rack shape tooling cutting edge (as shown in Figure 1) established basic principles of traditional gear design. 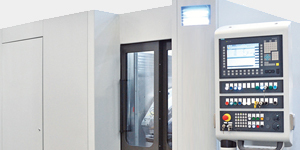 Parameters of the tooling gear rack such as the profile (or pressure) angle, addendum, whole depth, and fillet radius proportions are standardized and used as input gear design parameters. Selection of the standard gear rack becomes a starting point and foundation of gear design. This made the gear design indirect depending on pre-selected, typically standard, basic gear rack parameters. 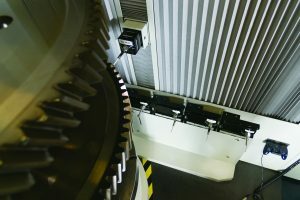 Major benefits provided by the traditional gear design approach include an availability of standards and software, ability to use one tooling rack for generation of gears with different numbers of teeth, potential gear interchangeability, and low tooling inventory. At the same time, this gear design method imposes significant limitations on the gear parameters and restrains the gear drive performance. Polymer gears are typically fabricated by an injection molding process (as shown in Figure 2), which does not use the rack type tooling. 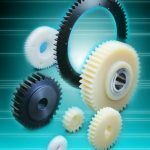 In addition, there is a clear trend to gear customization in general, especially in plastic gear drives. Polymer gears are not interchangeable and are designed specifically for a particular application. 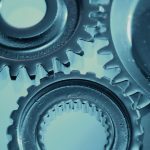 This practically diminishes all benefits of traditional gear design for polymer gears. 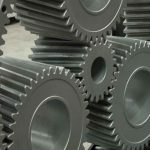 Nevertheless, the majority of polymer gears are designed traditionally based on the rack tooling generation of the gear profile. The traditional design approach does not allow for optimizing gear tooth geometry of polymer gears in all applications including automotive. An alternative Direct Gear Design method  defines the gear tooth geometry without using standard generating rack tooling profiles. 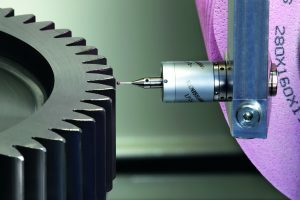 It is an application-driven gear geometry development process with a primary emphasis on performance maximization and cost efficiency without concern for any predefined tooling parameters. This means that the gear parameters are primary and the manufacturing process and tool parameters are secondary. This is the essence of Direct Gear Design. Two involutes of the base circle, the arc distance between them, and tooth tip circle describe the gear tooth (Figure 3). 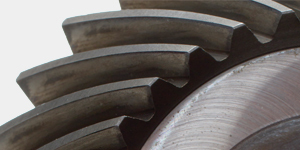 The equally spaced teeth form the gear. The root fillet between teeth is not in contact with the mating gear teeth. 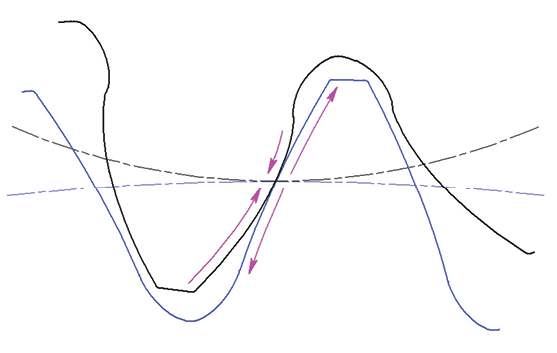 However, this portion of the tooth profile is critical because this is the area of maximum bending stress concentration. where is the involute function. 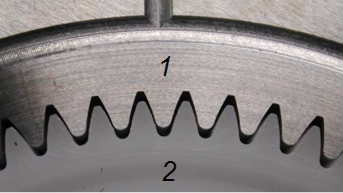 Two gears can be engaged in the gear mesh if they have an identical base pitch pb (see Figure 4). z1,z2 = numbers of teeth of mating pinion and gear. In gear transmissions, almost all inefficiency or mechanical losses are transferred into heat, reducing gear performance, reliability, and life. This is especially critical for plastic gears. Plastics do not conduct heat as well as metal. 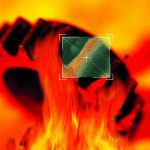 Heat accumulates on the gear tooth surface, leading to premature failure. 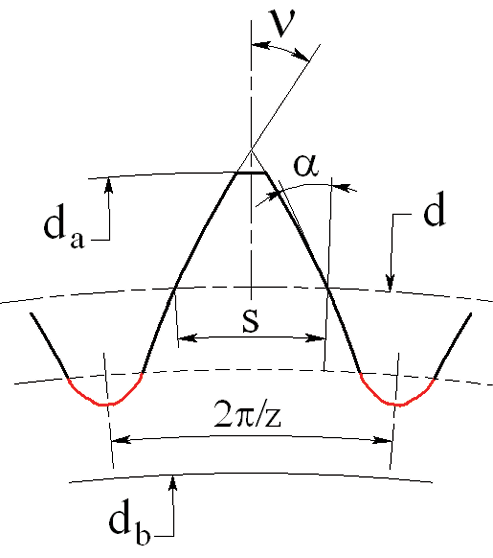 where: H1 and H2 are the maximum specific sliding velocities (Figure 5) of the pinion and the gear; f is the friction coefficient. where: a sign “+” for external gear mesh and a sign “-” for internal gear mesh. Unlike in traditional gear design, this can be done without compromising gear strength or stress balance. Mating gear teeth should be equally strong. Direct Gear Design defines the optimum tooth thickness ratio Sw1/Sw2 (Figure 6), using FEA and an iterative method, providing a tooth bending stress difference of less than 1 percent. If the gears are made out of different materials, the bending safety factors should be balanced. 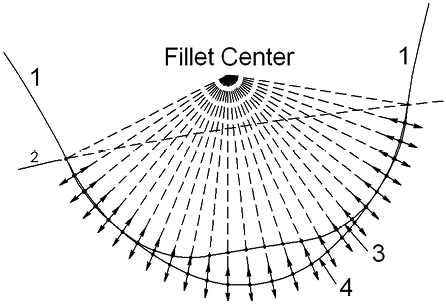 In traditional gear design, the fillet is defined by a trajectory of the cutting tool’s edge. This results in a large radial clearance and small fillet radii in the area of maximum bending stress. 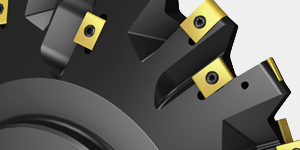 In Direct Gear Design, a fillet profile is optimized in order to minimize the bending stress concentration . The initial fillet profile is a trace of the mating gear tooth tip. 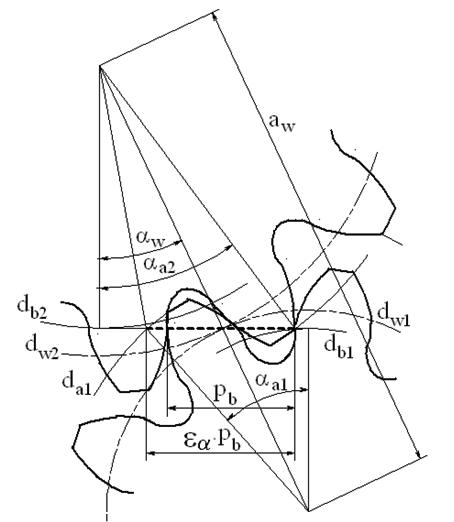 An optimization process is based on a finite element analysis (FEA) and a random search method (Figure 7). This optimization process sets up a center of the fillet and connects it with the FEA nodes on the fillet. Then it moves all the nodes along the beams and calculates the bending stress. The nodes cannot be moved above the initial fillet profile because it will lead to interference with the mating gear tooth. The process analyzes successful and unsuccessful steps, altering the fillet profile to reduce the maximum bending stress. 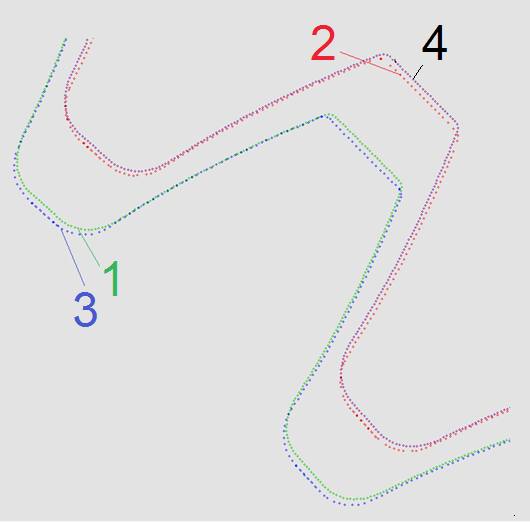 This process continues for a certain number of iterations, resulting in the optimized fillet profile. Table 1 (below) presents a comparison of maximum bending stress of the standard gear teeth and the same teeth but with the optimized root fillet. 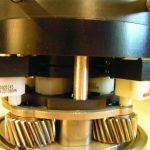 Selection of the proper polymer material for the application is critical to successful gear drives. 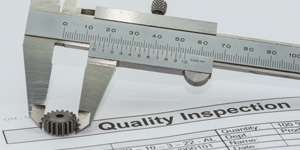 Factors that need to be considered include mechanical requirements, environmental issues, regulatory concerns, and cost. Plastic materials are typically divided by the temperature range in which they can be used. The “workhorse” materials, those that can be used at temperature limits from 80°C up to 140°C, include some of the nylon family (PA 6, 66), acetals (POM), polyesters (PBT/PET), and polycarbonates (PC). 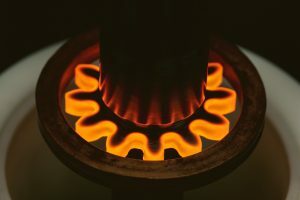 Another group that can be used at slightly elevated temperatures (up to 150-160°C) include polyphthalamides (PPA), nylon 46, and high-temperature nylon (HTN). 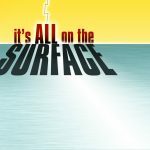 The highest temperature materials, those able to operate over 160°C and as high as 240°C, include polyetherimide (PEI), polyethersulfone (PES), polyphenylene sulfide (PPS), polyetheretherketone (PEEK), and liquid crystal polymers (LCP). 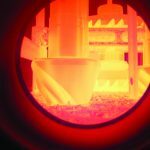 In general, the higher the temperature performance, the higher the cost for the material. 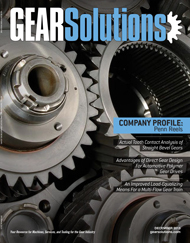 These materials are often modified to make them perform even better in gear applications. 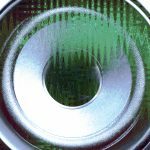 Strength modifiers such as glass, carbon, and aramid fibers can be added to provide materials that can take higher loads, which is an important feature when converting from metal to plastic. Other modifiers can be added to reduce friction or decrease wear. 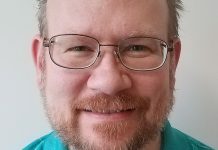 Some of these modifiers include silicone, polytetraflouroethylene (PTFE), graphite powders, and molybdenum disulfide (MoS2). 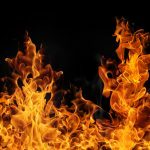 Many other modifiers can be added to provide heat and UV stabilization, impact enhancement, thermal conductivity, flame retardance, and anti-oxidation. 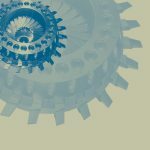 Designing gears with plastic materials requires careful consideration of the unique properties and responses of these materials to the gear drive system dynamics. 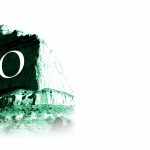 The designer may want to consult with material suppliers or knowledgeable gear molders on appropriate materials for the application. A comparison of traditional gear design and Direct Gear Design is shown in Table 2 below. The Direct Gear Design tooth flank and root fillet profile optimization provides a significantly greater contact ratio and bending safety factors. The most typical development of plastic gearing for small engines is the conversion of current metal gears to plastic. However, in most cases, simple material replacement is not adequate. 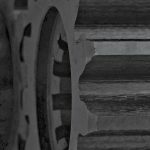 Gears must be redesigned to compensate for some of the “reduced” properties of plastics (lower tensile strength and limited thermal resistance) and emphasize their advantages (shock resistance, low weight, etc.). Table 3 (below) presents a sample of the metal-to-plastic conversion gear data. The molding tool cavity has a profile similar to the gear, but adjusted for shrinkage and warp that greatly affects the gear size and shape accuracy. 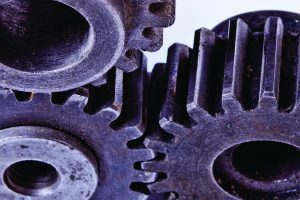 Plastic gears often include an intricate body shape that could be incorporated as one piece with other mechanism components, such as shafts and cams. These design specifics in combination with a huge variety of available gear polymers and enhancing additives (for increased strength, thermal resistance, lubricity, etc.) make prediction of gear shrinkage and warp an extremely difficult task. In many cases, gear molders use a trial-and-error method with a varying degree of success. 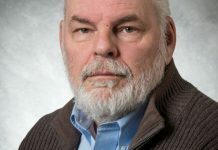 Typically, this educated-guess method works better for gears with a relatively simple body shape (e.g., a flat uniform disk with a small central hole) that are made out of generic unfilled polymers. 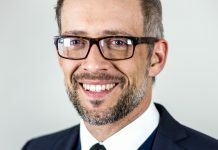 A totally different approach to providing molding distortion compensation was proposed by Dr. Yuriy V. Shekhtman . It is called the Genetic Molding Solution®. Similar to how the DNA contains genetic information about the entire live organism, the shape of the molded part reflects the originally designed profile, polymer material properties, tooling design, and molding process parameters. The Genetic Molding Solution method is based on mathematical prediction that defines a transformation function describing relations between the initially molded sample gear profile and its actual initial cavity profile. Once this function is defined, the target gear profile replaces the first molded sample profile as the transformation function variable to calculate the final cavity profile. Target gear profile definition (data file #1): The X,Y-coordinate points are extracted from the gear CAD model to present a desired nominal gear profile at average material condition. The number of these coordinate points is typically several hundred per one gear tooth. Initial cavity profile definition: Initial cavity profile is the scaled-up target gear CAD profile using the polymer linear mold shrinkage coefficient from the material manufacturer’s specification. Fabrication and inspection of initial mold cavity (data file #2): CMM inspection produces the X,Y-coordinate points (several hundred per one tooth space) accurately describing the initial cavity. Molding Process Optimization: Gears are molded using the initial cavity without concern about the gear shape. Here, the goal is to achieve a stable and repeatable molding process with the part dimensional variation significantly lower than the required accuracy tolerances. 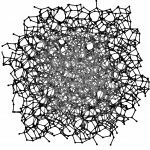 Any material flaws like voids are not acceptable. Once this goal is reached, the molding process must be locked-in and certified; no changes to the process are allowed. Using the optimized process, several dozen gears are molded. Representative gear specimen selection: All molded gears are roll-tested, and the inspection data is analyzed. Then, the most representative preliminary gear specimen is selected. This specimen should have average statistical tooth-to-tooth and total composite errors (TTE and TCE). Gear specimen inspection (data file #3): CMM inspection produces the X,Y-coordinate points (several hundred per one gear tooth), accurately describing the initial cavity molded gear. Inspection data of the initial cavity and the gear specimen must have the same radial orientation to assure that each gear tooth is properly aligned with its representative gear tooth cavity. Final cavity profile definition and fabrication: The Genetic Molding Solution software uses the gear specimen and initial cavity data (files #2 and #3) to generate a transformation function, f. The target gear data (file #1) is then used as the variable of this transformation function to define the final cavity profile — the output data set. The same radial orientation of all three data files is critical. Any angular rotation or mirroring of the data points totally compromises the mold cavity adjustment results. The final cavity is then manufactured and given a CMM inspection for verification of the gear cavity adjustment. Final gear profile: Gears are molded using the adjusted mold cavity. The CMM data of the molded gears should be identical to the specified gear profile within the molding process accuracy variation. Figure 8 illustrates the results of the Genetic Molding Solution software application. For successful application of the Genetic Molding Solution method, the initial and final gear molding must be done with the same batch polymer on the same molding press using the same mold and locked-in process parameters. 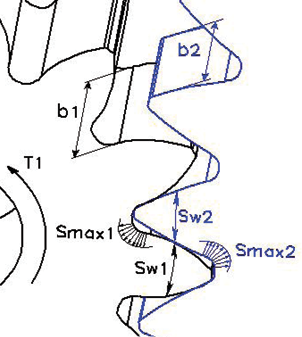 An example of this methodology is for the cam shaft gear application shown in Figure 9. This gear is not particularly molding-friendly: it has a metal over-molded shaft, two cams, six spokes, and three material delivery gates located in the middle of these spokes. Mold development for this gear using traditional methods requires considerable time and guesswork, as well as several mold cavity iterations. The Genetic Molding Solution method develops the desired cavity in a short time by direct calculation with only one cavity adjustment. The chart in Figure 9 shows a comparison of roll test graphs on the initial most representative gear specimen with the final gear sample. 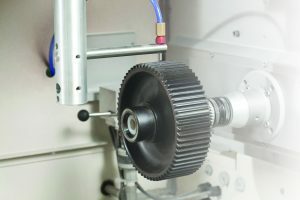 The initial gear roll test measurements (TTE and TCE) greatly exceed the required accuracy level, but the final gear roll test results fit well inside the TTE and TCE tolerance limits. The Genetic Molding Solution method significantly accelerates the mold cavity development for plastic molded gears. It eliminates a guess component of the final cavity prediction and provides the profile definition by the use of direct calculation. It is applicable not only to plastic molded gears but also to other plastic components. It also can be considered for other gear-forming processes that use mold or die cavities such as power metallurgy, die casting, and net forging. Increased safety factors to guarantee sufficient tooth strength considering the wide range of material property variations caused by the molding process, operating temperature, humidity, etc. The benefits of Direct Gear Design application include higher load capacity, reduced size and weight, extended lifetime, reduced noise and vibration, higher efficiency, higher reliability, and reduced cost. The Genetic Molding Solution provides a methodology for a scientific, accelerated, and accurate gear cavity definition based on data derived from material, process, and initial mold cavity geometry. Kapelevich, A.L., Direct Gear Design, CRC Press, 2013. Kapelevich, A.L., Shekhtman, Y.V., and McNamara, T.M., Turning an Art into Science. Motion System Design. August 2005: pp. 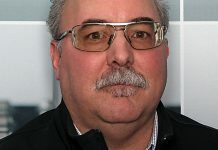 26-31.
is the research & development director for Thermotech Company. Thermotech is a precision custom molding company with expertise in plastic gear design, development, and manufacturing. Thermotech employs Direct Gear Design as the design methodology for plastic gear trains. McNamara has over 30 years of precision molding experience. He can be reached by email at thomas.mcnamara@thermotech.com.